An FBI search is on for the person whose fake phone threat grounded an American Airlines flight at SFO for hours. Federal agents tell us the front desk clerk at the Hampton Inn and Suites in Alameda got a phone call from a man screaming into the phone Thursday morning. The clerk could make out a few key words, including "American airlines," "Flight 24" and "hijack." The clerk immediately called police and the police informed airport officials. Within minutes, the plane was sent to a remote area of the SFO tarmac, where it stayed for two hours. Passengers were evacuated and taken back to the terminal where they had to go through security screening again. Police took a man and a woman from the back row of the plane into custody and questioned them but determined they were not connected to the alleged threat so they were released. The plane was heading to JFK International Airport in New York. 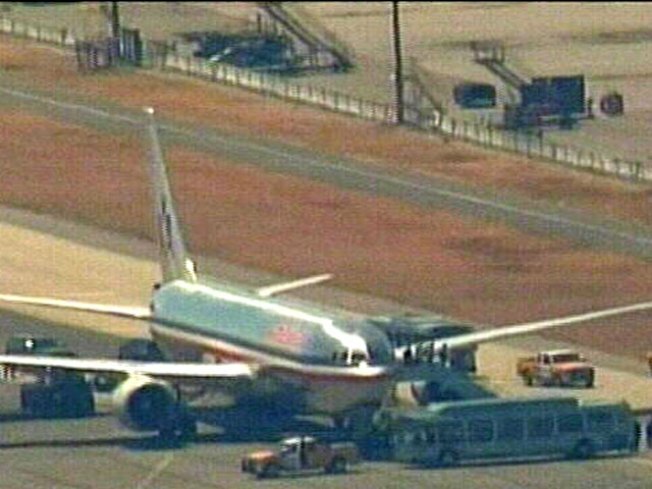 American Airlines spokesman Tim Smith said there were 163 passengers and 11 crew members aboard the Boeing 767. The plane was allowed to leave SFO just before 3 p.m. without any passengers. Some of the passengers were still in San Francisco Friday morning awaiting flights to continue their travels.